APTET 2019, APTET 2019 schedule, AP Teacher Eligibility Test 2019, Andhra Pradesh Teacher Eligibility Test 2019, APTET 2019 Online Application, Online APTET 2019, APTET Computer Based Test 2019, APTET Online application form, APTET Schedule, APTET Hall tickets, APTET Exam date, APTET Answer key, APTET Results and more details would be available on aptet.cgg.gov.in. The fith Andhra Pradesh Teacher Eligibility Test (APTET) 2019 Notification would be issued by the Department of School Education, Government of Andhra Pradesh in 2019 in all 13 Districts of the state. AP Teacher Eligibility Test for Recruitment as a teacher for classes I to VIII in the Schools of the State Government, Mandal Parishad, Zilla Parishad, Muncipality, Private Aided Schools and Private unaided schools in Andhra Pradesh state. Department of School Education would invite Online applications from the eligible candidates who intend to be teachers to appear for APTET 2019. The Candidates intending to seek employment as a teacher shall have the option of appearing at CTET conducted by Central Government through CBSE instead of APTET, if they so desire. The candidates who did not qualify in the 1st , 2nd, 3rd and 4th APTETs can also apply for the fourth APTET. Also the qualified candidates can also apply for 5th APTET if they desire improvement over their previous APTET score. 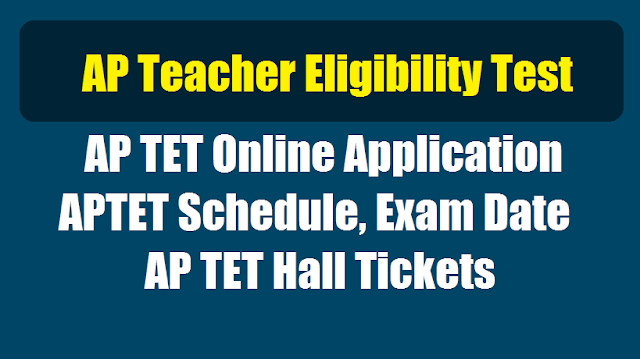 The AP Teacher Eligibility Test will be conducted 2 papers. The candidates who intend to be teachers I to V have to appear for Paper I and The candidates who intend to be teachers VI to VIII have to appear for Paper II A and Paper II B. The candidates who intend to be teachers I to VIII have to appear both papers, Paper I & Paper II. 1. The Andhra Pradesh Teacher Eligibility Test (APTET 2018) is being conducted by Department of School Education, Government of Andhra Pradesh in all 13 Districts of the State through a Computer Based Test. The objective is to ensure National Standards and benchmark of Teacher quality in the recruitment process in accordance with the National Council for Teacher Education (NCTE). 2. Online applications are invited for the Andhra Pradesh Teacher Eligibility Test (APTET 2019) from candidates for all those aspiring to be Teachers in State Government, Mandal Parishad, ZillaParishad, Municipality, Private Aided Schools and Private un-aided schools in Andhra Pradesh State for classes I to VIII. Govt. of India have enacted RTE Act, 2009 on 27.08.2009 titled “The Right of Children to Free and Compulsory Education”. Sub-Section (1) of section 23 of the RTE Act, National Council for Teacher Education (NCTE), New Delhi has laid down minimum qualifications for a person to be eligible for appointment as a Teacher for Classes I to VIII in its Principal Notification dated 23rd August, 2010 and amendments issued thereon. The minimum qualifications include a Pass in Teacher Eligibility Test (TET). Pursuant to the said Guidelines, it has been decided to conduct Teacher Eligibility Test (TET) twice every year for all persons, who aspire to become Teachers for Classes I to VIII in all Schools (Govt. / ZP / MP / Municipal /Recognized Pvt. Aided & Pvt. Un-Aided etc.,) in the State of Andhra Pradesh in the references read above. 3. All candidates who possess D.Ed.,/ B.Ed., / Language Pandit or equivalent qualifications and candidates pursuing final year of the said courses during the academic year 2016-2017 with requisite percentage of marks obtained as given in information bulletin of APTET can appear for APTET. However, the candidates intending to seek employment as a teacher in private unaided schools shall have the option of appearing at CTET conducted by Central Government through CBSE instead of APTET, if they so desire. The candidates who did not qualify in previous TETs can also apply. Further, the candidates who got qualified in the earlier APTETs can also apply for 6th APTET, if they desire improvement over their previous TET score. the candidates intending to be teachers for classes VI to VIII have to appear for Paper-II. The candidates who intend to be teachers for all classes from I to VIII can appear for the both papers, Paper-I and Paper-II. The fee towards submission of application online and for the conduct of computer based examination is Rs.500/- for each Paper-I & Paper-II. Candidates shall pay the fee through payment Gateway from ...05.2019 and submit online application at the APTET websitehttp://cse.ap.gov.in from ..05.2019.
can download the ‘Information Bulletin’ free of cost from the APTET website: http://cse.ap.gov.in from ...05.2019 onwards. Candidates can submit their applications online from ...05.2019. The APTET 2019 shall be conducted ‘ONLINE’ in the 13 districts on the above mentioned dates (i.e. form ..-06-2019). Candidates may give the preferential order of the centres. However, allotment of centres shall be the discretion of the department and request for change of test centres or sessions is not allowed under any circumstances. The candidates at the time of applying for APTET 2019 should be in possession of the minimum qualifications prescribed for a teacher for I to V classes (Paper-I) and VI to VIII classes (Paper-II) as given in Information Bulletin. The candidates who are pursuing final year of any of the Teacher Education Courses recognized by the NCTE or the RCI, as the case may be, during the academic year 2018-2019 can also appear for the APTET 2019. However, it is clarified that appearance or a pass in APTET by itself will not vest any right on the candidate to be considered for appointment to the post of Teacher in Government / ZillaParishad / Mandal Parishad / Municipal and Private Aided Schools, unless he is in possession of the qualifications prescribed for appointment to such post in the relevant statutory recruitment rules framed by State Government from time to time or by the said management as on the date prescribed there in. Details of qualifications prescribed for APTET are provided in the Information Bulletin. The structure and content of each part of Paper-I and Paper-II of the fourth APTET, and the breakup of the total 150 marks among various parts of the paper are given in the Information Bulletin. Syllabus for APTET can be downloaded from http://cse.ap.gov.in. Note 1: Differently abled candidates with at least 40% of handicap only shall be considered in respect of Visually and Orthopedically Handicapped. With regard to Hearing Impaired candidates, a minimum of 75% handicap shall be considered. APTET Certificate / Marks Memo shall be valid for a period of 7 years from the date of TET examination in accordance with NCTE Guidelines. 20% weightage will be given to APTET scores in the ensuing Teacher Recruitment of the State Government. In other words, 20% weightage is for APTET score and 80% weightage for written test in Teacher Recruitment Test (TRT) for drawing up the selection list. The candidates should have a Inter /Senior Secondary / Degree with Teacher Education Courses by the NCTE or RCI / Language Pandit Training Courses. Candidates who are pursuing final year any Teacher Education Course or Language Pandit Training Courses can also appear for the APTET 2019.